PT Indosat Tbk – Indosat or more popularly called “Indosat Ooredoo” is a well established public-listed company in Indonesia that is involved in telecommunication services. Indosat Ooredoo has its business activities focused in three services and segments; cellular, fixed data and fixed telecom. Indosat Ooredoo is widely known nationwide as one of the largest internet and celluler providers in Indonesia and is positioned inside the top three of cellular operators in Indonesia in terms of total subscribers. As of Decemer 2015, Indosat Ooredoo has a total of 69.7 million active cellular subscribers. 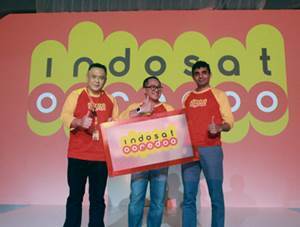 Headquartered in Jakarta, Indosat Ooredoo runs its business through 10 areas, 72 sales areas, 102 sales clusters, 29 MPC and 169,303 outlets throughout Indonesia. Indosat Ooredoo also supported by 5 subsidiaries and 5 affiliated subsidiaries. Indosat Ooredoo is a local subsidiary company of Ooredoo Group (previously known as Qatar Telecom), a leading telecommunication services company in Middle East region. Ooredoo Group is the majority shareholder at PT Indosat Tbk, with 65% of ownership. Another 14.29% are owned by the Government of Indonesia, while the rest are owned by public (20.71%). In term of financial performance, Indosat Ooredoo succeeded in posting excellent financial performance in 2015. According to PT Indosat Tbk Annual Report 2015 as quoted by JobsCDC.com, Indosat Ooredoo booked total consolidated revenue of Rp 26,769 billion in 2015. This figures reflected a 11% growth as compared with Rp 24,085 billion in 2014. EBITDA increased 14% from Rp 10,033 billion in 2014 to Rp 11,473 billion in 2015. Holds around 1-3 years experiences in marketing communication. Good attitude and hungry to learn. Familiar in social media (active). Good skills in reporting and administration.